Neurologists, neuroscientists and some neurophysiatrists are able to monitor the brain using an MRI or magnetic resonance imaging. American neurologists are using a new scan called a functional magnetic resonance imaging to better assess blood flow to the brain. By examining blood flow in the brain, neurologists are better able to see the brains “activity” by tracking blood flow. This is one, or the many new tools available to neurologists when it comes to better understanding and treating brain injury in Ontario. Before this science existed, doctors and lawyers had to go based on what patients told them, or based on man made questionnaires. The problems with these answers is that there is no standardized scale for measuring pain. One accident victim’s definition or pain, or poor memory, may be different than the next person’s. On a pain or problem scale of 1-10; 1 being low, and 10 being the highest, how would you rank your pain; or memory problems; or depression? One person’s rating scale is again different than the next. This level of subjectivity and also human error is the subject of critique by Plaintiff lawyers, and lawyers for the insurance company alike. Lawyers also aren’t able to tell whether or not the person is exaggerating, minimizing or simply doesn’t understand the nature of the questions being put to them is is just answering questions at random. Even during the course of a 5 hour testing session, this tendency to doze off and get complacent exists which can skew the data one way or another. The subjective data and findings when it comes to brain injury can make assessing and quantifying damages for a personal injury or disability case that much more difficult. How can a jury really get in to a person’s head to understand their pain, memory issues, depression and cognitive problems. They can’t. The only thing we have to go on is the credibility and like-ability of our experts, witnesses and the parties. This is why, until the medical science has been perfected; the most important part to a brain injury case is how well your experts present; how credible, believable and likable is their evidence. This, coupled with the credibility, like-ability and believe-avability of the witnesses and parties goes a very long way in a personal injury case involving a brain injury as opposed to another sort of case involving a more physical injury (like broken bones). At the end of the day, if the Judge and Jury aren’t buying what the medical experts, character witnesses and the injured party are trying to convey; chances are the award will reflect this. The same theories apply to the value of the settlement of the case outside of a Court setting. If the insurance company and their lawyer(s) don’t believe that the injured party who alleges that s/he has sustained a traumatic brain injury and can no longer function; chances are they won’t offer very much money (or none at all ) to resolve the case outside of Court. One of the most remarkable things with brain injury because a lot of the data collected and relied upon can be son subjective and subject to so much ambiguity; that one expert can testify and provide findings on one end of the spectrum; yet another expert may testify and given evidence of their findings which are on the opposite end of the spectrum. Then it will be up for a Judge and jury to decide who’s right, or who they believe more. That’s where credibility and like-ability come in and play a large factor in these case. While medical science is progressing in the area of brain injury, it has yet to catch up and isn’t quite perfect. Brain injury cases remain complicated and subject to a wide range of scrutiny from a variety of experts. Even the experts say we still have a long way to go towards better understanding the brain and brain injury. But, we are getting there. Slowly but surely, the law is adapting and accepting scientific advances being made in the field of brain injury and brain mapping. The better the science behind the case. The stronger and more convincing the case will be. And the better able you can convince the jury that you’re right. The stronger the likelihood that they will side with you. 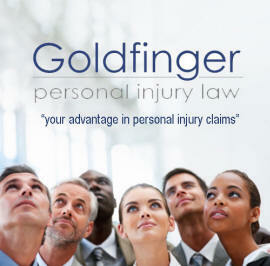 Brian Goldfinger is the director and of Goldfinger Injury Lawyers. With offices in Toronto, London, Peterborough and Kitchener-Waterloo, Goldfinger Injury Lawyers is able to serve claims all across Ontario on behalf of injured parties and disability claimants. Their law firms only acts for the injured and does not accept cases on behalf of large insurance companies. They take on all of their cases on a contingency fee basis whereby you gain the Goldfinger Guaratee: No Win? No legal fees! It’s that simple and straightforward. Contact Brian Goldfinger for your free consultation today.